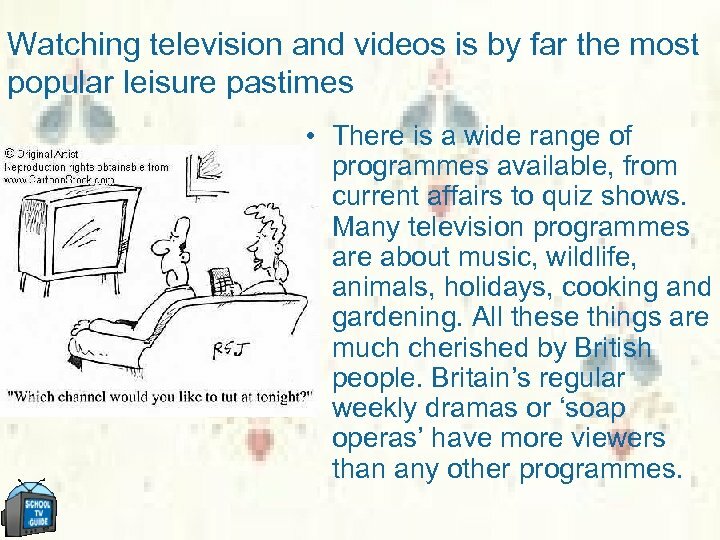 Watching television and videos is by far the most popular leisure pastimes • There is a wide range of programmes available, from current affairs to quiz shows. 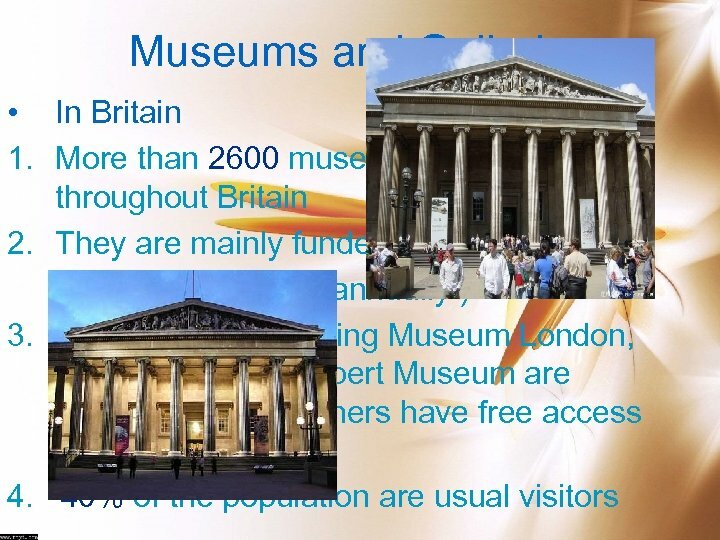 Many television programmes are about music, wildlife, animals, holidays, cooking and gardening. 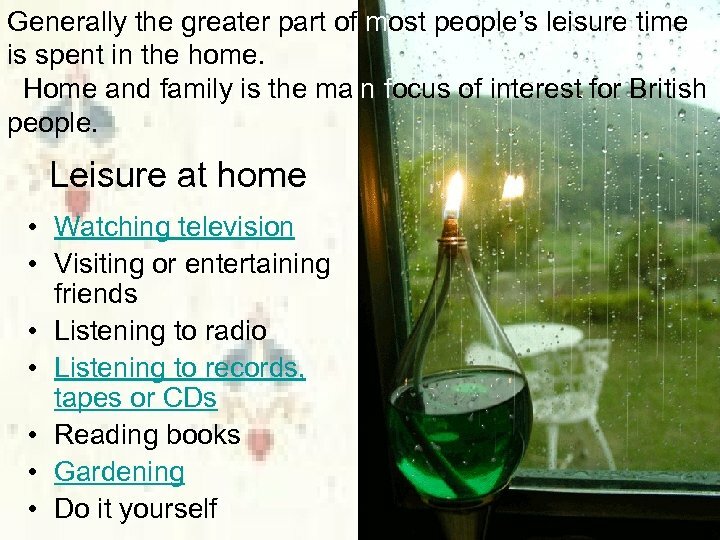 All these things are much cherished by British people. 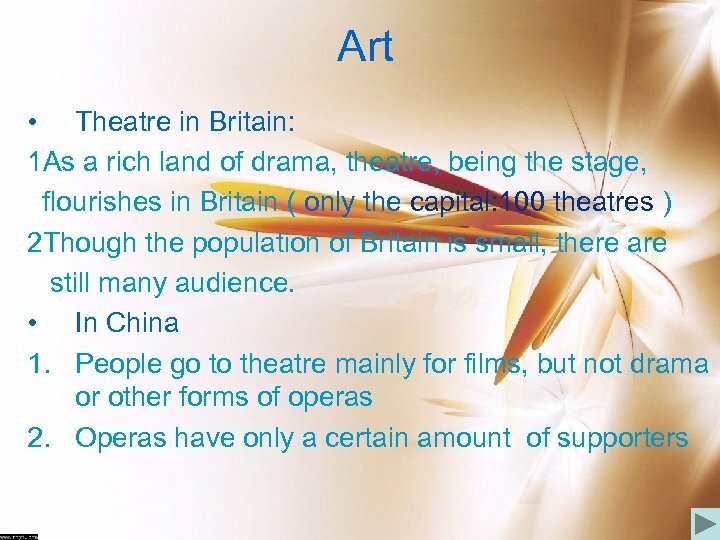 Britain’s regular weekly dramas or ‘soap operas’ have more viewers than any other programmes. 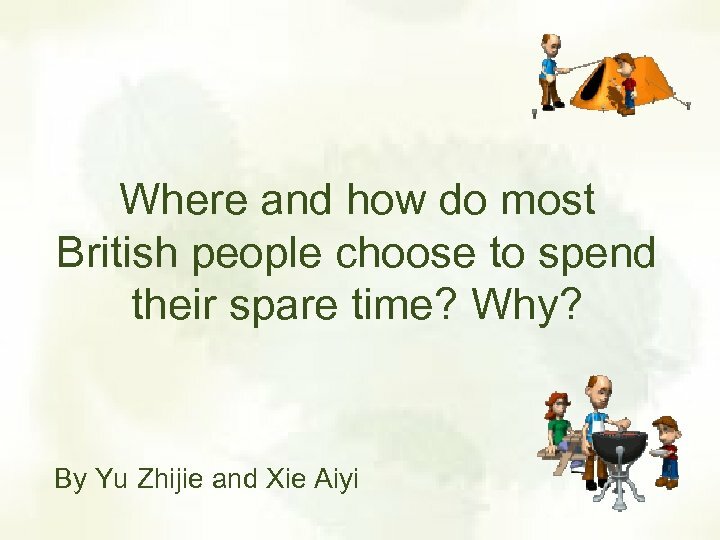 • The British are known as a nation of gardeners. Gardening has been a popular pastime since Roman times. 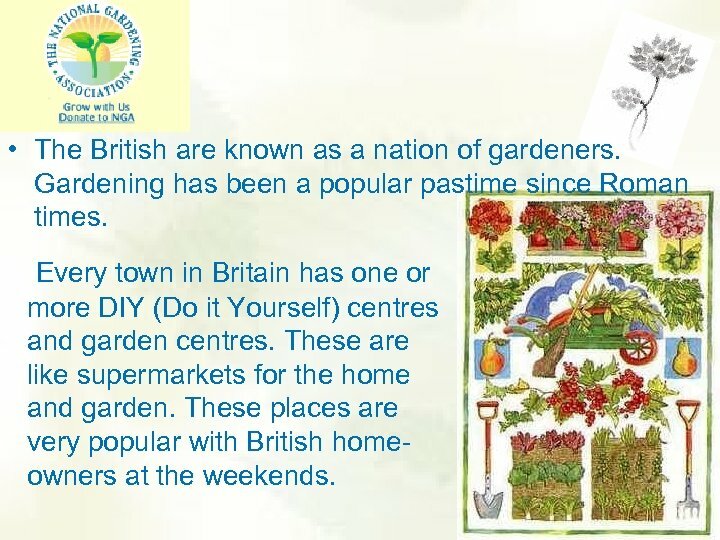 Every town in Britain has one or more DIY (Do it Yourself) centres and garden centres. These are like supermarkets for the home and garden. 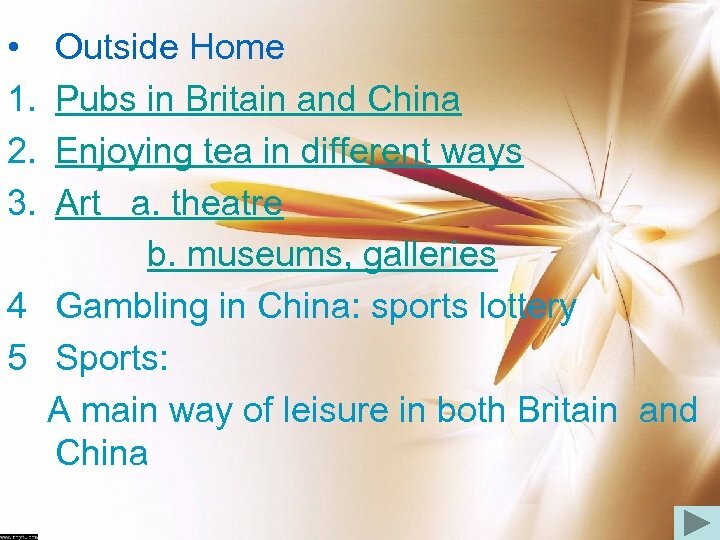 These places are very popular with British homeowners at the weekends. 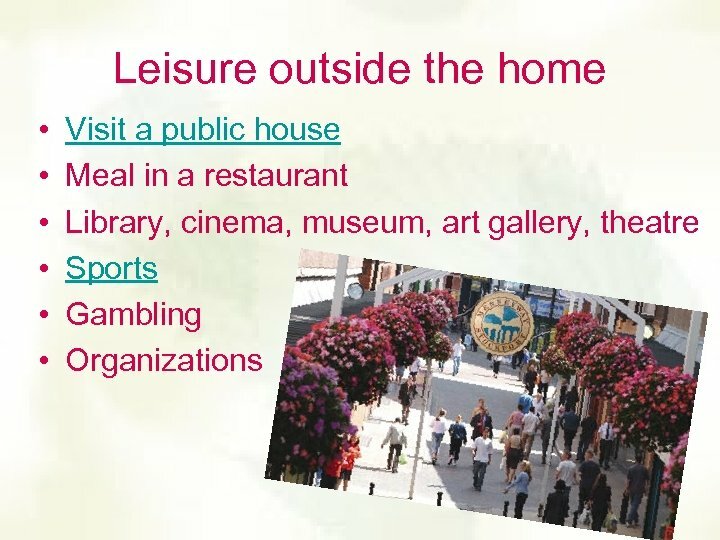 The most common free-time activity outside the home amongst adults is a visit to the pub. 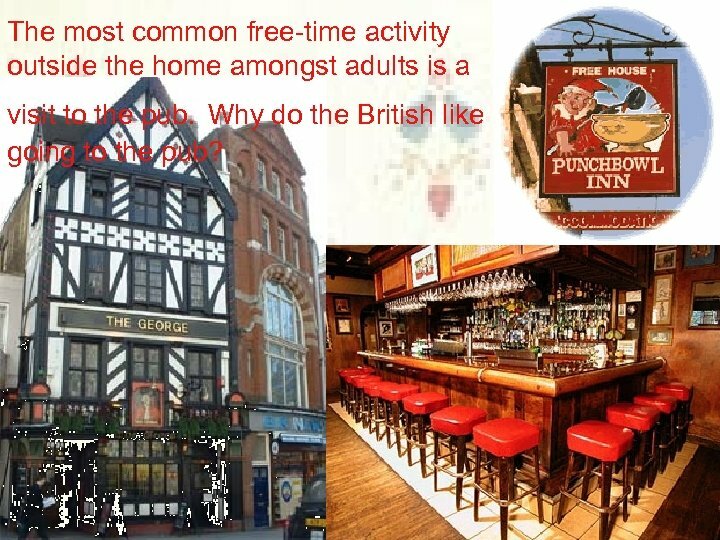 Why do the British like going to the pub? 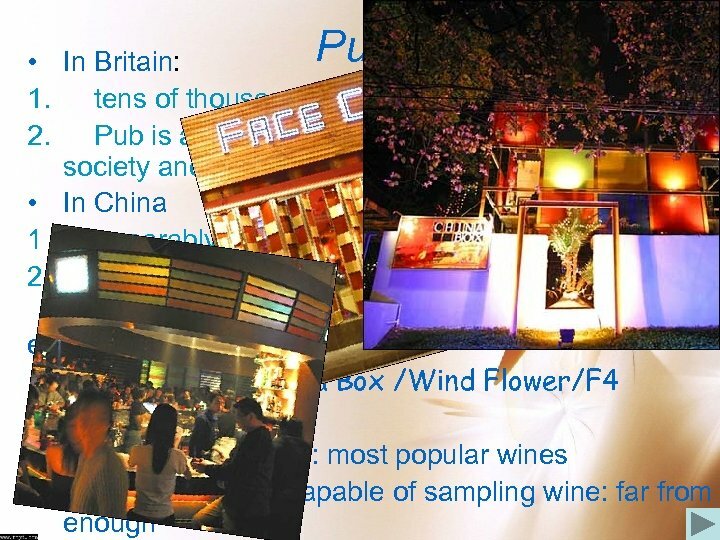 One of the main attractions of the pub for all regular pubgoers is that it offers good company in friendly surroundings. Good conversation and good beer are two essential items provided by the pub. beer is the perfect drink for the pub. 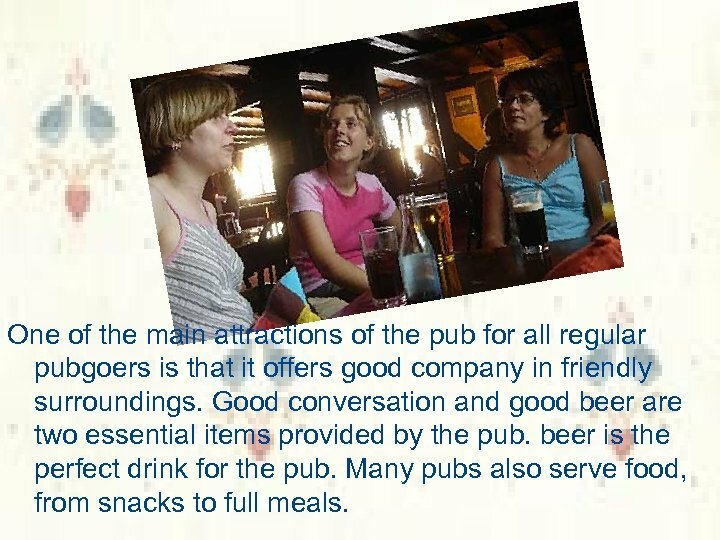 Many pubs also serve food, from snacks to full meals. 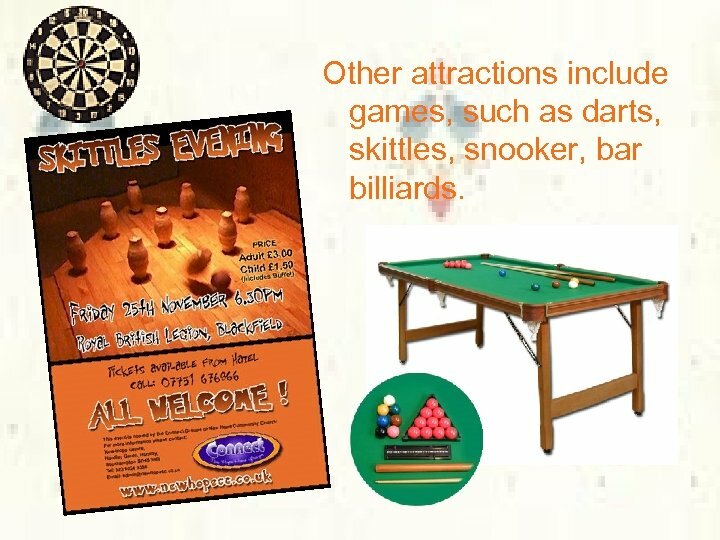 Other attractions include games, such as darts, skittles, snooker, bar billiards. 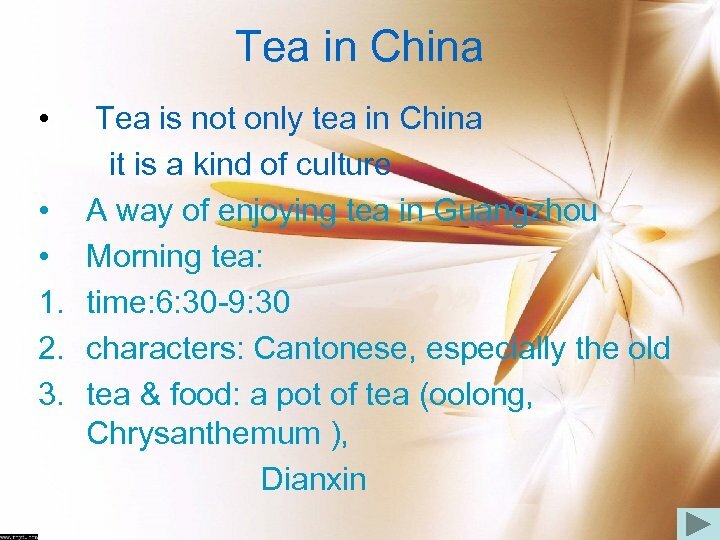 • The teashop is almost as British as the pub. From 3. 00 and 5. 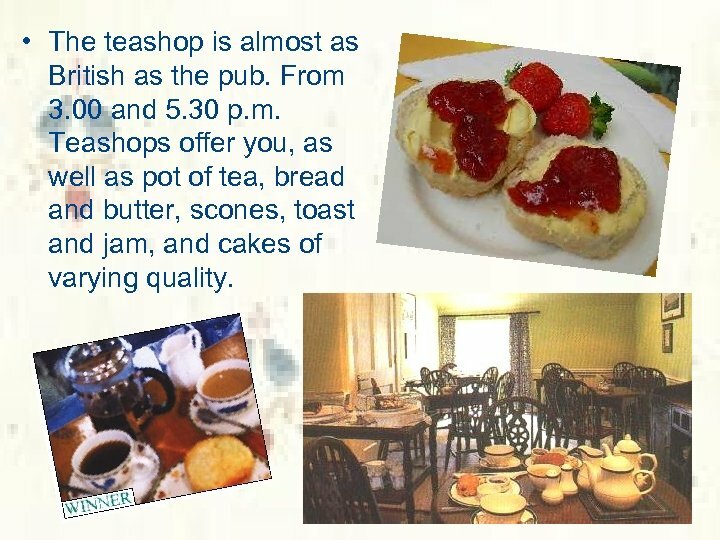 30 p. m. Teashops offer you, as well as pot of tea, bread and butter, scones, toast and jam, and cakes of varying quality. 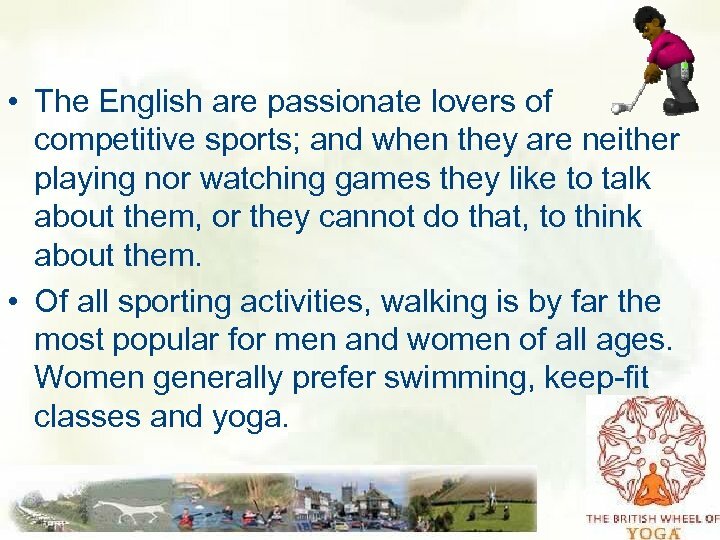 • The English are passionate lovers of competitive sports; and when they are neither playing nor watching games they like to talk about them, or they cannot do that, to think about them. • Of all sporting activities, walking is by far the most popular for men and women of all ages. 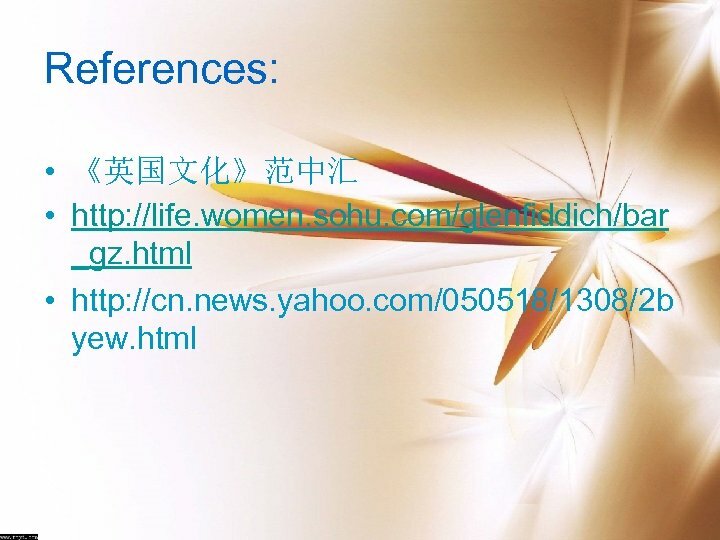 Women generally prefer swimming, keep-fit classes and yoga. • The game peculiarly associated with England is cricket which has been extensively adopted only in the Commonwealth. 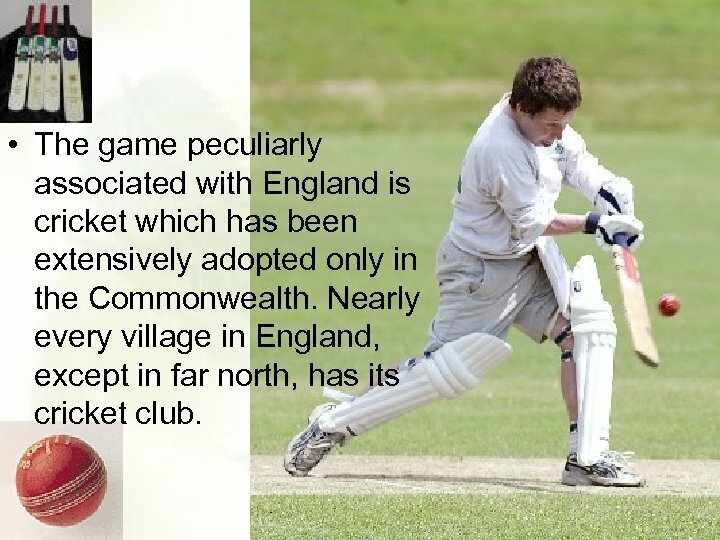 Nearly every village in England, except in far north, has its cricket club. 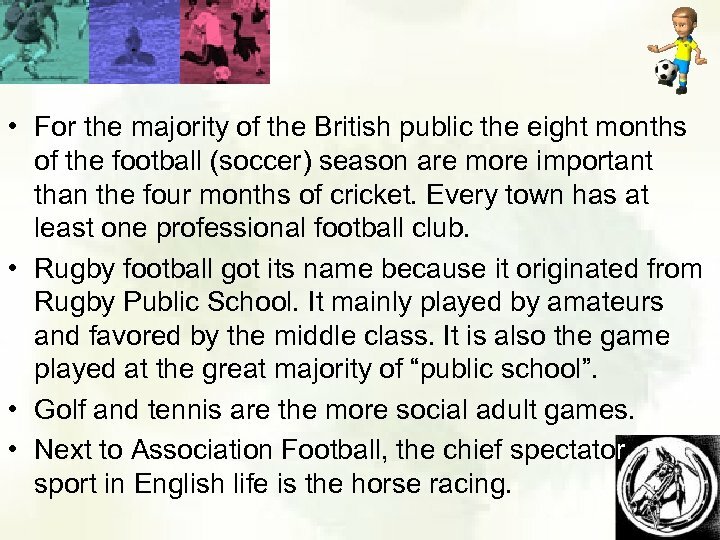 • For the majority of the British public the eight months of the football (soccer) season are more important than the four months of cricket. Every town has at least one professional football club. • Rugby football got its name because it originated from Rugby Public School. It mainly played by amateurs and favored by the middle class. It is also the game played at the great majority of “public school”. • Golf and tennis are the more social adult games. 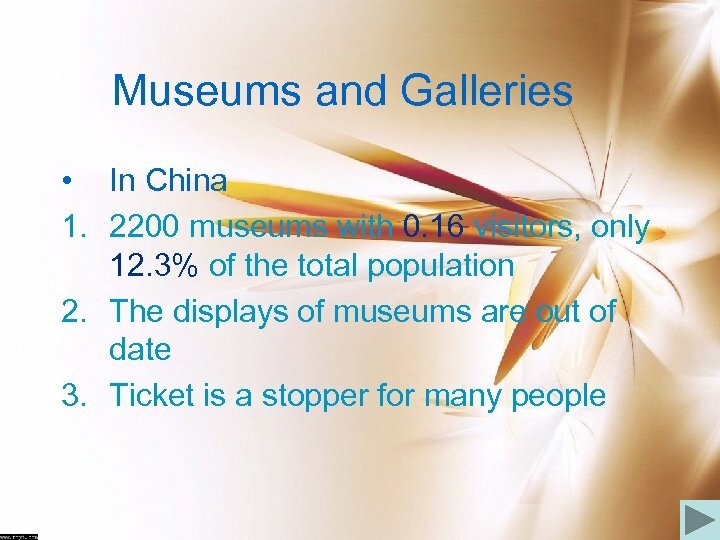 • Next to Association Football, the chief spectator sport in English life is the horse racing. Gardening • In Britain 1. 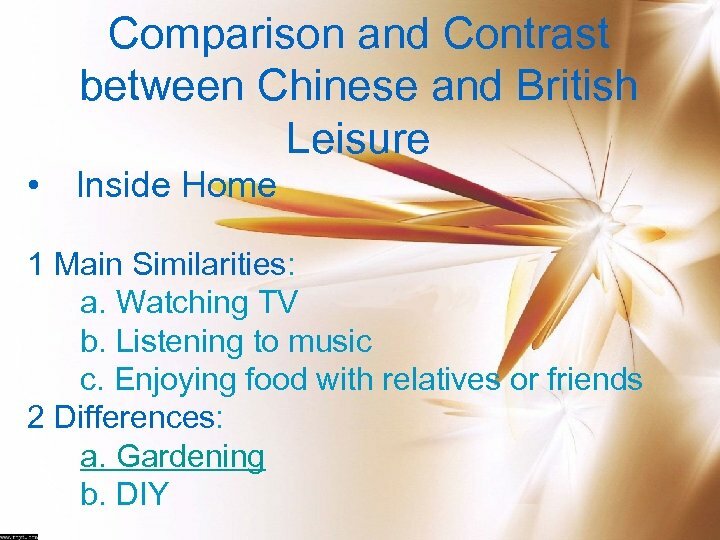 Many British own their own homes with attached gardens (about 70% in 1999) 2. 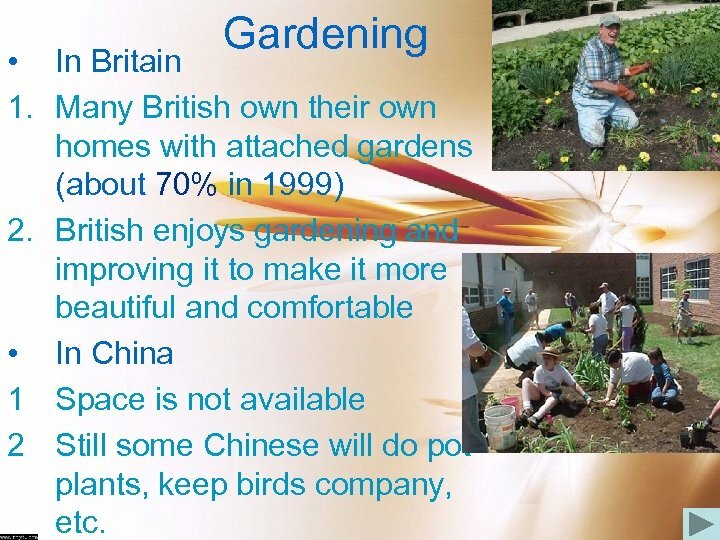 British enjoys gardening and improving it to make it more beautiful and comfortable • In China 1 Space is not available 2 Still some Chinese will do pot plants, keep birds company, etc.